Master Forger Clair chose Studio Calico’s Lost River kit as our inspiration this month. Did you know that “September (from Latin septem, "seven") was originally the seventh of ten months on the oldest known Roman calendar, with March (Latin Martius) the first month of the year until perhaps as late as 153 BC. After the calendar reform that added January and February to the beginning of the year, September moved places to become the ninth month, but retained its name. It had 29 days until the Julian reform, which added a day.” Thank you Wikipedia, because I did not know that. It’s always good to learn a little lesson on history, isn’t it? Okay, S, that seems rather a random start to explaining this gist of this kit. Have you meandered too far, are you lost? Where will you go from There? 2. and white, to complement it. 4. and blue, to complement it. 5. Gold – either textured like glitter or shiny smooth, or both, depending on your mood. 6. Something inspired by the great outdoors, maybe the thrill of mountains and the calm of lakes. 7. A sense of adventure, a willingness to explore. Yes, try picking out your elements two at a time, like traveling buddies setting out together along an unknown path. It's good to have a friend along in circumstances like these. Does that give you a road map to compiling your September kit? Please do share your kits and layouts with us this month, we want to know what you've discovered on your explorations. 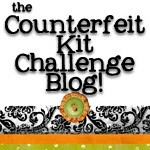 PS For those of you thinking September kits have to have 9, not 7 elements (‘cause we’re not in ancient Rome, S!) just add circles and wood grain. PPS There were actually clues in that diversion paragraph of mine to this month's two challenges. Let your mind wander about those possibilities! This is so so so clever! I might follow your directions for my kit!